For professionals working with pupils with PMLD, SLD and MLD. This website contains lots of useful content related to the SEN sector. This includes professionals teaching pupils with profound and multiple learning difficulties (PMLD), severe learning difficulties (SLD) and moderate learning difficulties (MLD). EQUALS Members are able to advertise their school ‘SEN Job Vacancies‘ for free. 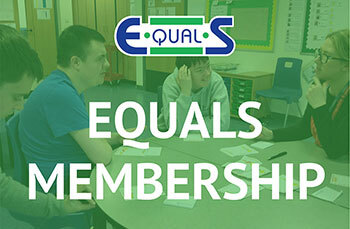 To become a member of the EQUALS charity costs only £120+VAT for 12 months. Non-members can also submit their job vacancies for £125+VAT per year. A ‘News and Discussion Forum‘ is provided. This helps share ‘best practice’ and highlights ‘current government guidance and support’. Members are welcome to contribute, and the forum itself is open to everyone for free. Training courses are also showcased from a variety of venues across the UK. If there is a topic, which is not listed, please get in touch. We will try our very best to arrange this for your school. As a charity we organise two ‘National Conferences‘ per year and over twenty ‘Training Courses‘. At a time where school budgets are more limited and many schools are finding it more difficult to access training. 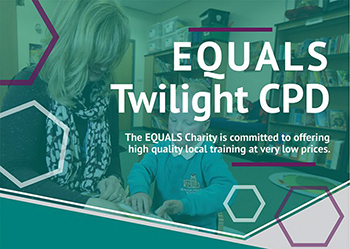 EQUALS is making every effort to offer training more locally. Prices are also being kept low, at only £19 per delegate for members, £59 per delegate for non-members for ‘Local Twilight Workshops’. National Conferences are provided at £149 for Members and £249 for Non-members. For schools which are registered for VAT, please include VAT at the rate at the time. For any schools that feel they would benefit from training directly in their school, full and half day inset days are available. Most content at www.equalsmembers.org is accessible to everyone, however for all the resources listed in the ‘Members Content’ area, only EQUALS subscribers can access this. ‘EQUALS Members’ help support the important work we do every year, with their £120 annual membership contributions. If you are not a member and would like to subscribe to the EQUALS Charity please visit the ‘Membership Page‘. Non-members can however, use the rest of the site freely, and still purchase any of our Curriculum and Assessment materials. Members benefit from substantial discounts however on curriculum and assessment materials, training and conferences. For the last 24 years EQUALS has developed and published curriculum materials. These have been for pupils that are working below age-related expectations. 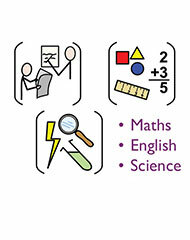 These popular Schemes of Work (SoW) are present in most schools throughout the UK. Traditionally these have either been formal subject-specific and linked to Assessment Schemes like the ‘P Scales’ or 14+ topic based and linked to ‘Levels of Engagement’. Following changes in statutory guidance in relation to the ‘P Scales’ and the 2014 changes to the National Curriculum, EQUALS has invested time and resources into developing some new schemes of work for a brand new Semi-formal SLD/MLD Curriculum and a Pre-formal PMLD Curriculum. A new Informal Curriculum for what was P4-P5, is currently being planned to compliment our existing portfolio. “The Curriculum, must be at the heart of education” Amanda Spielman, HMCI (2018). Curriculum and the new Ofsted inspection framework, September 2018. Schools now have more flexibility to deliver a more be-spoke Curriculum, where the ‘Schemes of Work’ and any ‘Assessment’ are developed around the individual pupil. Schools across the UK are working towards offering a ‘Broad and Balanced Curriculum’ . ‘Schools have the freedom to use any curriculum they feel is appropriate for the needs and requirements of their pupils (where they are not engaged in subject specific learning)’. EQUALS continues to offer formal subject-specific materials, which remain appropriate for those pupils that are achieving towards the top end of what was the P Scales, and there are updated SoW available for Maths, English and Science. 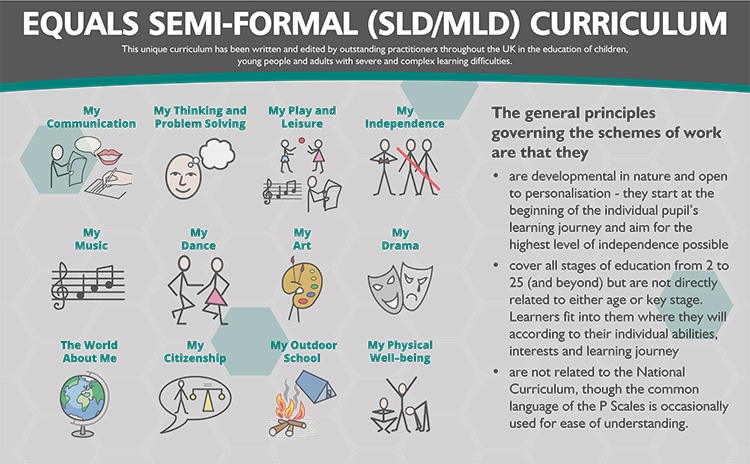 Semi-formal SLD/MLD Curriculum – 10 Schemes of Work published, with 2 more in development.